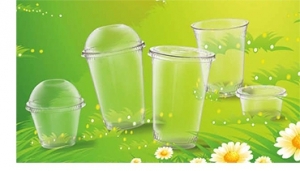 Made from eco-friendly materials, Greenware® cold cups, lids and portion containers do not use petroleum based elements. Using Ingeo™, a bioplastic resin made completely from plants, Greenware® products are a great alternative. This material is renewable and are replenished every year! Ingeo™ is a PLA. This stands for polylactic acid, or Polylactide, a versatile polymer. NatureWorks’ creates the Ingeo™ biopolymer which is eventually used in Greenware® products. The process used to create PLA is similar to the fermentation process, used to create beer and wine. It uses dextrose as a base feedstock which, like fermentation converts sugar to lactic acid. Natureworks’ uses dextrose from No.2 yellow dent field corn that is grown with 300 miles of their factory in Blair, Nebraska. This dextrose is used to produce the PLA found in Greenware® products. This plant only uses one half of one percent of U.S. corn crop, when operating at full capacity. The products manufactured by Greenware® are made to be 100% compostable and if managed in compost facilities at a specific temperature and moisture point. The products follow the standard of ASTM D6400 and are certified. If managed correctly, the products will compost within about 50 days. Because of the sensitivity of the products, we do not advise home composting. Well managed landfills are sealed. This ensures not product within degrade or break down. Because of this Greenware® products are not made to immediately break down in landfills. While Greenware® products can be recycled, many facilities do have they ability to recycle PLA-based products. To find a commercial composting facility in your area, visit http://www.findacomposter.com/. Made by Fabri-Kal, Greenware® products are American made in Kalamazoo, Michigan. This plants employs more than 800 workrs throughout the country. Greenware® can be a powerful asset for your business, showing your customers that you care about the environment.Communicate that message by serving their purchases in Greenware® products’ attractive stock print options. Or have Greenware® drinking and portion cups custom printed in up to 5 colors with your own logo and message. Call your BioMass Packaging sales representative to learn more.